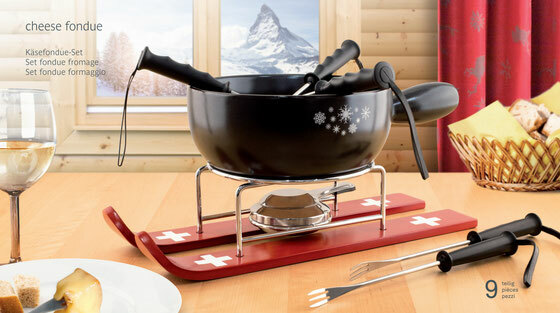 Although the fondue tradition did not originate with tavolaswiss, the firm specializes in designing and engineering high-quality, innovative fondue appliances. This skill has made tavolaswiss the domestic market leader. Equally adept at traditional, classic and modern design styles, tavolaswiss develops caquelons (pots), rechauds (stands) and fondue sets to satisfy every demand. Our experience with fondue makers and trusted partnerships with prestigious brand-name suppliers ensure that these tabletop cooking products are perennial sellers in all the leading kitchen supply and department stores. In Switzerland, you can find our products under the Koenig and Kaltenbach brand names as well as in Manor department stores.